Eat all the carbs you want AND lose weight? Absolutely! Contrary to the anti-carb movement, the eating program described in this book makes healthful starch-based foods the centerpiece of a low fat wellness diet. Dr. John McDougall, bestselling author and creator of the nationally renowned diet and exercise book "The McDougall Plan", presents a cookbook that turns the popular thinking about carbs and weight control upside down. 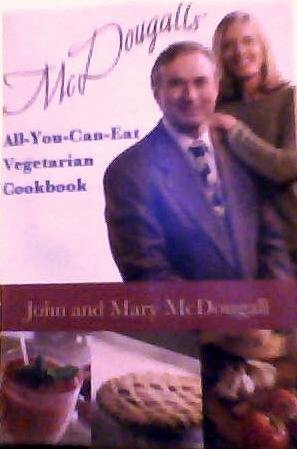 Filled with some of John and Mary McDougall's favorite vegetarian recipes from their own kitchen, this book is a great addition to your personal library if you are considering becoming a vegetarian or want a refresher course on the nutrients your body needs to run like a lean, clean machine. Dr. John McDougall is a certified internist who has been studying and writing about the effect of nutrition on disease for more than 30 years. Mary McDougall has contributed her nutritional expertise and recipes as co-author on many of the bestselling McDougall books. Product Description: Contrary to the anti-carbohydrate movement, the eating program described in this book makes healthful starch-based foods the centerpiece of a fat reducing, wellness-promoting diet.